O’Doodles owner Fran O’Donnell embraces an ‘unplugged’ philosophy when it comes to his toy store. 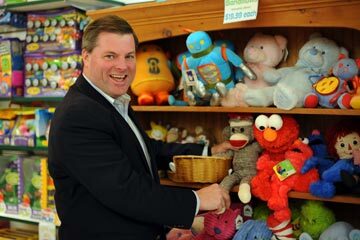 Since 1997, Chestnut Hill’s renowned toy store O’Doodles has prided itself on its motto: “Toys Unplugged!” Owner Fran O’Donnell believes in bringing back the good ole days of play with his style of inventory which is, for the past, not powered by any electronics. So, you won’t find any DVDs, PS3s or Wii anywhere ‘round these parts. Instead, O’Doodles aisles are filled with puzzles, board games, books, stuffed animals and more. “I think nowadays everyone is so plugged in with either organized sports, activities or electronics-and that to kids now is defined as ‘play’. We firmly believe here at O’Doodles in a back-to-the-basics philosophy and introducing the fun of playing and encouraging imagination. So, by embracing the idea of only having toys that are powered by a child’s creativity, we offer a unique and exciting selection for parents,” explained O’Donnell. O’Doodles has a spacious second floor and due to customer demand, in Mid December, the store will start hosting kids’ birthday parties. And, in January, O’Doodles will offer a series of yoga classes for the little ones. For now and the next three weeks, O’Donnell and his staff will be concentrating on stocking his shelves with the best toys possible for his customers. Here are seven of our store favorites below to guide you for the gift-giving season and of course, suggest to Santa. If your kids want a family pet but you do not want a mess or the cost, then the EcoAquarium by Wild Creations is ideal. It’s a complete aquatic ecosystem environment that requires no additional chemicals, filters, or aeration. The frogs only need water changed every five or six months using fresh, bottled spring water. In addition, the compact aquarium has “living gravel”, which acts as the natural filtration system for the aquarium so it never has to be cleaned. 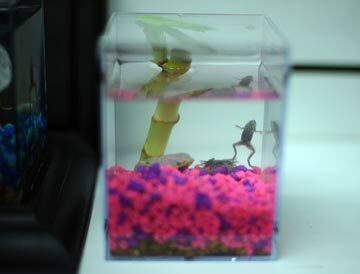 And, each EcoAquarium comes with two male frogs so there are no worries of the couple multiplying. O’Doodles received the aquariums in August and has already sold over a hundred, so they feel confident it will be a top seller for shoppers the next few weeks. Recommended for kids 6 years of age or older, the toy challenges children to move a ball through a complex maze. Perplexus is a 3-D labyrinth game enclosed in a transparent plastic sphere. By twisting and turning the sphere, players attempt to maneuver a small, steel ball through an intricate maze composed of narrow plastic tracks. There are obstacles of varying difficulty that must be navigated in order to reach the end. 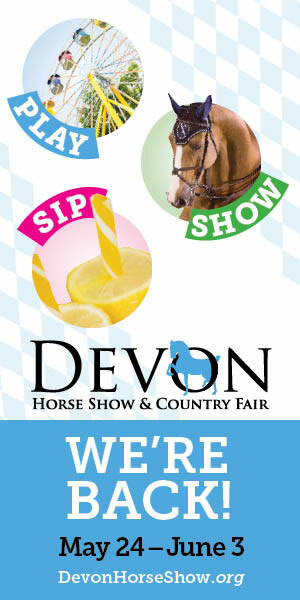 The experience offers hours of entertainment and fun. Automoblox’s motto is “Dream It, Build It, Drive It.” A great toy to keep kids occupied for long car rides or dining out with the parents, Automoblox is a high-quality building system that will inspire children’s creativity. Creator Patrick Calello holds a degree from Carnegie Mellon University in industrial design. 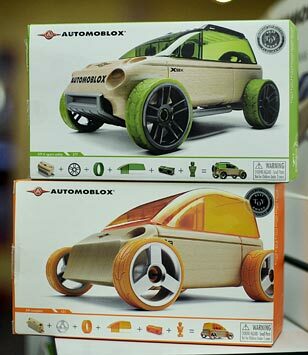 A toy car concept fashioned out of wood, Automoblox encourages creative problem solving, gross and fine motor skills and Visio-spatial processing. Mom always said don’t play ball in the house, but she never mentioned any restrictions on air! Created by a company called Can You Imagine, Laser AirZooka promises to help youngsters “launch a full air assault without ever leaving the ground.” Airzooka is the ‘fun gun’ that sends a harmless ball of air towards any object, or person from up to fifty feet away. Kids can have fun as, seemingly from nowhere, they are able to mess up a person’s hair, ruffle their shirt, dress, or just plain blow them away! 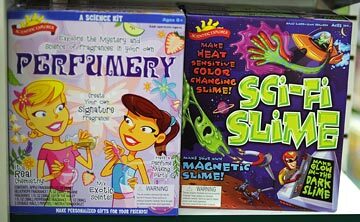 A camouflaged chemistry set, kids can create their own pizza, crystals, perfume, slime, soda pop, bubblegum and more with Scientific Explorer’s fun variety of kits. A winner of the Oppenheim Toy Portfolio Best Toy Award, Gold Seal, the ‘Ultimate Spa and Perfume Kit’ includes everything you need for a complete spa experience. Using natural ingredients, little girls can have a blast creating bath oils, oatmeal soap, foaming baths, bath balms, and more. In addition, kids can learn about aroma therapy as they blend five different kinds of perfume. Perfect for spa parties, sleepovers, and rainy days, it’s no surprise the explorer gifts are expected to be one of O’Doodles top sellers for the season. Loaded with 120 funky and fun sticker designs, kids can play for hours cutting out a picture, using the included stencils, or drawing their own design. Roll it through the Sticker Factory and it instantly creates a sticker-cool! Kids can create fabulous gift tags, decorate notebooks, or stylize a scrapbook. The Sticker Factory comes with 178 pre-printed sticker designs, one 10-foot roll of sticker paper, one 10-foot roll of sticker film, one 6-design stencil, burnishing tool, pencil and easy to follow instructions. A Sticker Factory refill (sold separately) includes an additional 10 feet of sticker paper and sticker film. ‘You’ve been Sentenced!’ was created by Wilmington native Don McNeill who is in talks with major tv networks and Nickelodeon for a game show version to launch this spring. 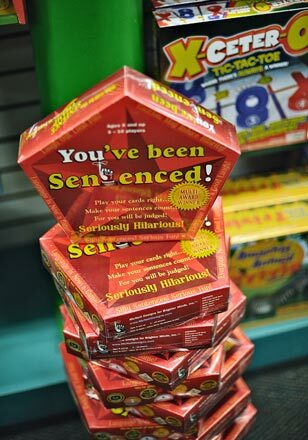 The latest in the evolution of games, “You’ve been Sentenced!” is the first game in history to really turn making sentences into a very funny, playable, and challenging game. Using a unique word deck of pentagon shaped cards containing conjugations of funny words, famous names from throughout history, familiar places, and wild cards, players have to make grammatically correct and justifiable sentences. The real fun begins when players have to read their sentences out loud and explain what they mean to the rest of players. They form the jury and vote thumbs up or down on whether the sentence and justification stand and the points are scored. 540 cards with over 2,500 words insure billions of possible sentences so the game is never repetitive and has unlimited re-play value. O’Doodles is located at 8335 Germantown Avenue, Chestnut Hill, PA 19118. 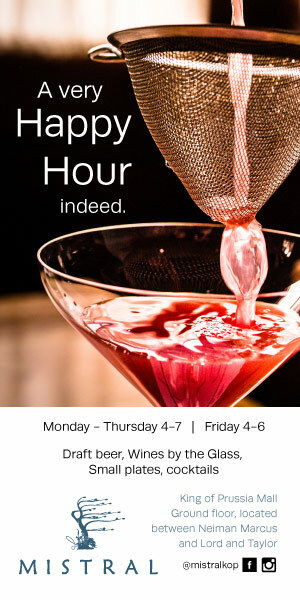 Holiday hours of operation are: Monday thru Thursday 10-7pm, Fridays 10-8pm. O’Doodles will be open till 9pm on Stag and Doe Nights starting Dec 9th. 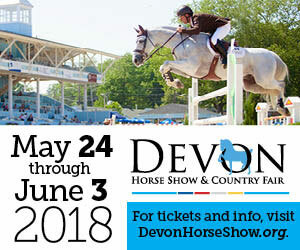 Saturday 9:30 to 6pm, Sunday 11-6pm. 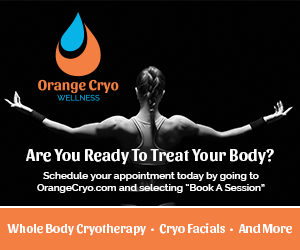 Visit their website at: www.odoodles.com or call 215-247-7405.